Good news! Bonaventure Cemetery resumed its normal operating hours, from 10 am until 5 pm, Friday, December 15, 2016. 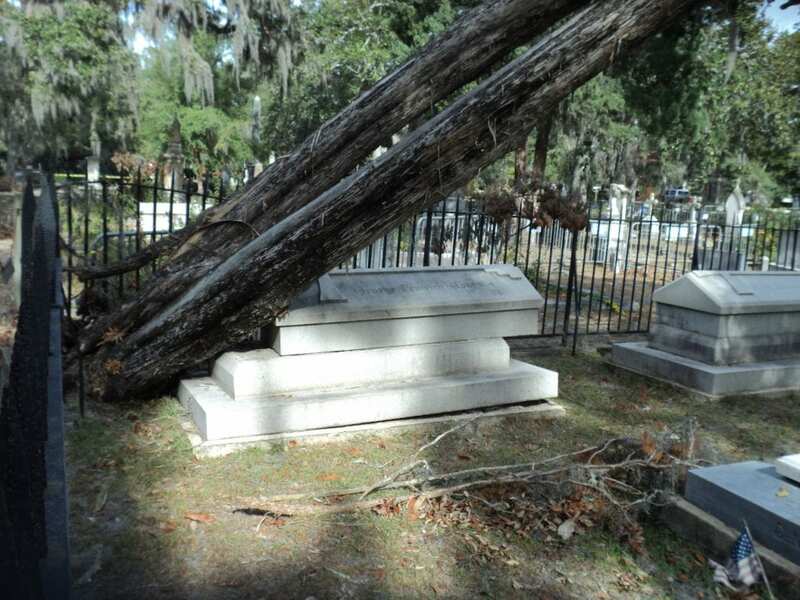 Most of the damaged trees from Hurricane Matthew in the historical section have been dealt with. There are still a few sites where barricades remain, so be careful when visiting. We will let everyone know once Bonaventure Historical Society free guided tours begin again. Determine the reason for cleaning – because of possible compromise to the stone itself, don’t clean for the sake of cleaning. Preservation is the key here. Identify the type of stone, some stones can deteriorate from certain cleaning methods. If you can’t identify the stone, don’t clean it. Make sure the stone is secure, and protect the area around the stone from the cleaning process. Only use solutions specifically designed for the stone, common cleaning detergents are not appropriate. Clean from bottom to top to avoid staining the stone. Rinse, rinse, rinse with low pressure water only. Regular or frequent cleaning is not recommended – remember no matter how gentle, each time a stone is cleaned a small amount is removed. And most importantly, if you have a doubt consult with a stone conservation professional. You can download a copy of our mobile guide directly from Apple iTunes or Google Play. Proceeds will be used to fund restoration efforts. Facebook: Bonaventure Historical Society, Inc.
PreviousPrevious post:Bonaventure: From Plantation to MonumentNextNext post:Bonaventure Cemetery Open! Bonaventure Cemetery is nearly sold out! And Tourism is increasing! © 2017 Bonaventure Historical Society. Site developed by My Agency Savannah.